ImageOut Write is the literary companion journal to the annual ImageOut Film Festival of Rochester, NY. “Color Me Your Color Baby” appears on p. 20. of Volume 3: Personal Pronouns, edited by Brad Craddock. It’s an appreciation of Blondie. I don’t realize this at the time, because as a dissociative teen boy, I realize very little of consequence. I experienced a major shift in consciousness, brought on by this pop song–a very good pop song, but still. I’ll circle back to this moment, that ecstasy in the back seat of that spacious and smooth-rolling vehicle, over and again, for decades. The longing this song instilled in me has bent the trajectory of my existence. It was the song and its connection to the movie, but not the movie itself, remember: I only took the time to watch Paul Schrader’s conflicted, uneven film very recently, on Netflix. At sixteen, I had to supply my own paramount pictures. I never did summon the courage to buy the record, or embrace the band as a fan. 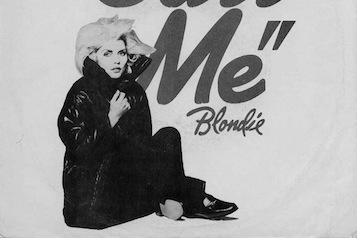 Instead I internalized it; “Call Me” became not so much an anthem but a tic, an obsession, like grinding your teeth, or twitching. That driving beat was my adrenaline response; those crashing guitars pulsed at my temples as I stared down at my changing body in the shower, as I dodged the enforcers, as I wandered through suburban nights.